Conflicting accommodations do not always mean that the conflict will occur between separate PWDs. For example, on a high pain day, I am in desperate need on my cane due to the intense pain in my hip and legs in general (though, which leg I want to use if for is debatable, even though I favor one hip). When I am that fatigued, however, using the cane is an intense use of my spoons, to the point where if I have too much to do I can’t even bother because it just winds up with me on a chair or bench in tears. Or the cane causes additional pain in my back or shoulders. There are others that come to mind. My medication provides me with more pain free days, which is a good thing. This is an active choice I made with the advice of my doctor whom I was lucky enough to find at this duty station. The flip of that coin is that I have side effects which means that I can not always drive places, or have the energy (HA!) that I want to do things with my family, to name a few. This might not sound like a huge accommodation, but it makes a great impact on my family life, people who play a huge role in my care. I know that some people use caffeine to both relieve some pain and migraine effects (I sometimes do) but that this has the crash effect at the end of the day (for me it means my spoons run out faster). So, gentle readers, what accommodations do you have/use that conflict…uhh…internally? What individual needs to you have that you have to weigh daily? When I wrote about Jenny McCarthy last week, I focused primarily on how her “cure” efforts affect parents. Today, I want to write about how “cure” efforts affect children with disabilities. I feel pretty safe in saying that most people who are born with disabilities, or develop a disability very early in life, have experienced the Pressure To Appear Normal. The ones I have talked to have told me that the greatest amount of pressure to Appear Normal has come, either directly or indirectly, from their parents. It took me a long time to convince Don that it was okay to talk about being in pain and how he felt about everything. 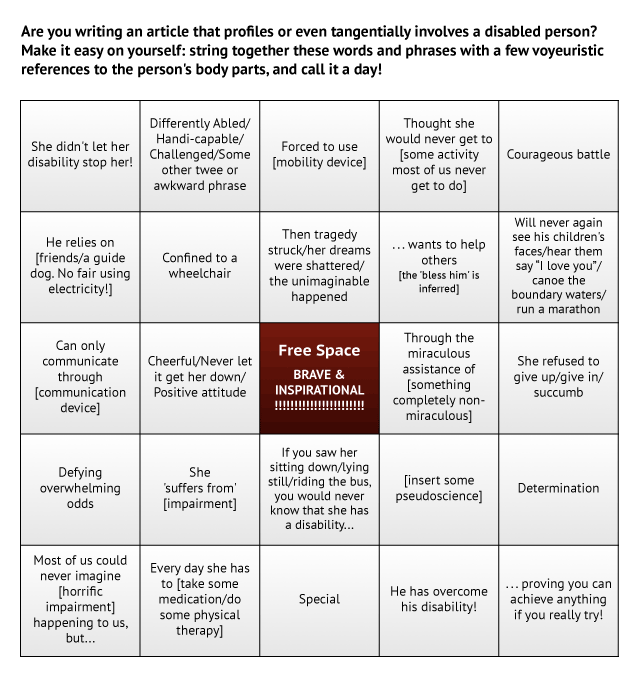 Like me, his previous attempts to talk about his disability led to his mother being upset. His attempts to appear normal means he went over a decade needing far more assistance than he was getting. He felt like a failure for getting a cane, because everyone would “know” he was disabled. Getting the cane, and now his wheelchair, has led to a drastic improvement to his quality of life – and it didn’t happen until he was in his late 20s. 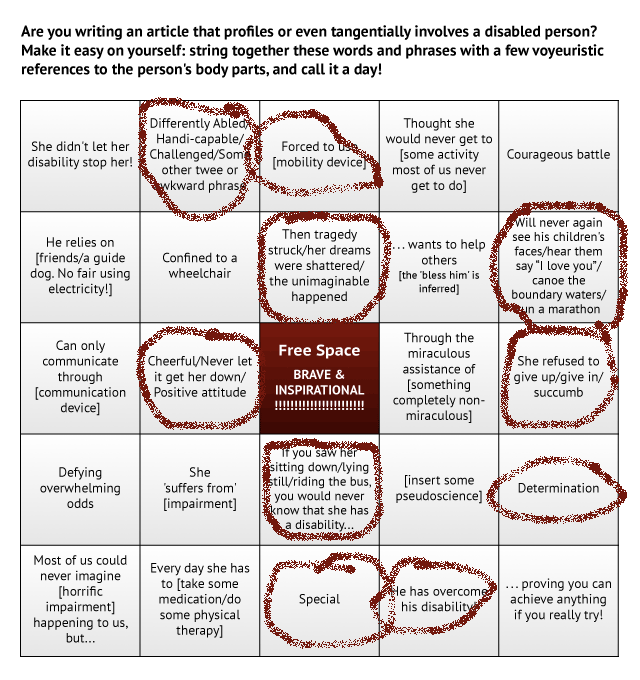 If you read many of the Very Special Lessons-type news media stories about disability, they will often include a paragraph about how the person with a disability’s parents had at some point pushed for them to be in a “regular” school until, giving up, they finally admitted their child needed more help than they were able to get there. It’s often presented as a sadness, that this child couldn’t “overcome”. From Deaf children being denied Sign Language until their late teens to grandparents refusing to be seen in public with their autistic grandchildren until they can learn to behave, there is are a lot of messages disabled children receive from their families: Be Normal. Look Normal. Don’t upset us by not being Normal. I hope my last post made it clear that I’m very sympathetic to the situation parents find themselves in. There are simply not enough resources available to help families. There is constant pressure on parents to explain how they “made” their kids disabled, and what they’re doing to “fix it”. I don’t just think that pressure is there. I know it. I know for certain that Don’s mother still feels guilty for “making” Don disabled. But children are very aware of the pressure to be normal. And when people like Jenny McCarthy and her ilk push “cures” for disability out there, not only are parents asked why they aren’t administering these cures, children are, either directly or indirectly, asked why they aren’t cured, too. Try harder. Do more. It will make everyone else feel more comfortable.